Will an XNA “XBox 360 Project” also work on Windows? I understand that an XNA project for XBox 360 will use a specialized version of the .NET Compact Framework. But let's say I want to release for both XBox 360 and Windows. Will the XBox version (using compact framework) still work if distributed for Windows, or would I need to rebuild against the regular framework (or the non-Xbox CF) in order to distribute? Yes, different platforms run different .net runtimes. The way this works in xna 3/3.1/4 is you create your game project for a single platform (say, create a new Windows Xna game project in visual studio). 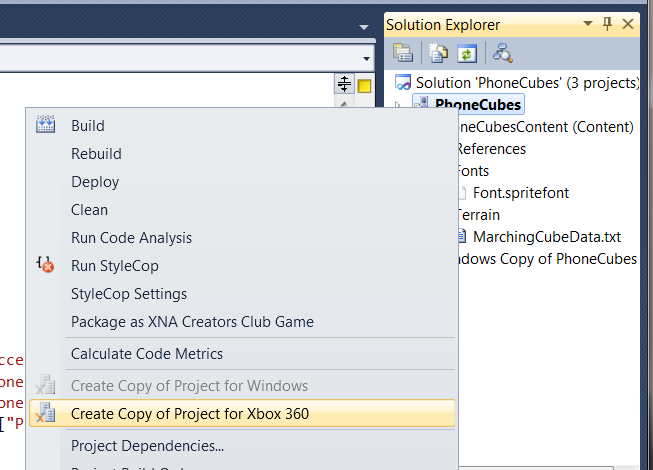 In visual studios 'solution explorer', right click the project and then chooses 'create copy of project for X', where x is the platform you want the new project to target. Thats pretty much all there is to it. These two projects are kept in synch, anything you add to one will show up in the other. Use #if WINDOWS or #if XBOX or #if WINDOWS_PHONE blocks to add code that is specific to a single platform. You need to rebuild for Windows. There is a tool to automate the process of converting the visual studio projects. Since you started on the 360 and the compact framework you should be largely okay. Going the other way you can run into issues where you use .Net framework features that aren't supported by the compact framework. The docs contain a section on differences between the two (for example, you can't set the processor affinity on Windows). If you're actually releasing your game on the PC you might run into compatibility issues. Eg, your render buffer format might not be supported, or your shaders might not compile. This is the curse of PC development though and not specific to XNA. Not the answer you're looking for? Browse other questions tagged xna windows xbox360 or ask your own question. XNA: How does threading work? How can I deploy a Xbox 360 game onto a disc?